Yes, it sounds weird enough to strike fear in the hearts and minds, possibly stomachs, of many. But, a fair number are willing to try it and some have even become converts. You may have become aware of the kombucha trend in health food stores, which carry a highly sweetened, often fizzier version of the drink that substitutes for carbonated soft drinks. Well, this is like that, but I can control the level of sweetness (I prefer less) and make it for pennies per bottle, while also creating many different flavour combinations to suit my tastes (spicy candied ginger is my favourite so far). 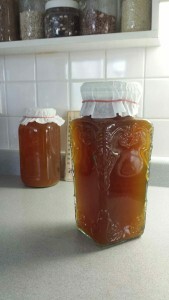 There are a variety of great online resources to learn about kombucha, with my all-time favourites being Cultures for Health and Kombucha Kamp. These folks have been invaluable as I’ve stumbled my way from my first unsuccessful attempt to a counter full of brew in various stages. Cultures for Health has an online chat service that has saved me numerous times, particularly when I was about to chuck a batch of dairy kefir grains; these guys are my heroes for being ready to answer a plethora of questions and support the growing cultured food movement one convert at a time. And I’ve learned lots more than recipes from Kombucha Kamp. Of particular great interest to me was the list of healthy and highly bioavailable micronutrients I discovered are lurking in this deliciously deceptive drink. You know the old adage that it has to taste bad to be good for you? Not true! 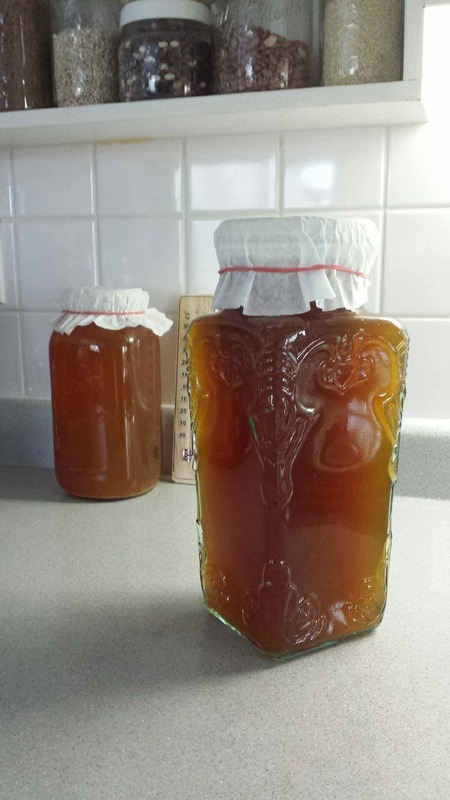 I’ve become such a raving, and possibly annoying, fan that I’ve converted several friends and have since provided several with scobys so they can begin brewing on their own. There’s always a bit of a learning curve to get the routine sorted out, but once you’re in the swing of it, kombucha is an easy, guilt-free alternative to soft drinks that also packs a very healthful punch. 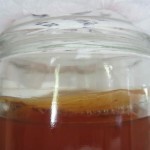 My first attempt at kombucha was a failure. 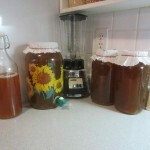 Batch brew, continuous brew and bottled kombucha. 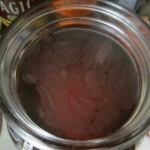 Growing a healthy scoby to pass along to a friend.